The Pearl District is Portland’s most upscale, nearby downtown and loaded with fine dining, bars and shopping. We walked South and then East to the riverside park for a bit before circling back to the full block of food trucks between 9th and 10th Avenues and Washington and Alder Streets. Portland is famous for food trucks, many organized in pods and seeming a bit more permanent than those in LA which truly move around constantly. There is another cluster we saw at 3rd and Washington and across the river on the Eastside they are everywhere, often found in little parking lots and at times accompanied by live music. Though it was tough, we passed up the panoply of options covering lots of Thai, Indian, Middle Eastern, Fijian, waffles, BBQ, Mexican, Georgian (the country), etc. Instead, I ordered a sandwich at Lardo and brought it to Jenni’s table around the corner at Grassa (same owner). My pork belly with heirloom tomato, arugula and caper mayo on ciabatta was delicious and very reasonable at $8, and Jenni loved her rigatoni with braised pork and an iced tea for $10. We grabbed our laptops from the car and fit in a little session at Starbucks on 11th and Lovejoy before driving up to Nob Hill and walking around 23rd Street. This is another fairly upscale area with some yuppies and good dining options. Salt & Straw, an ice cream shop, was packed. We left this area and took the Ross Island Bridge to our first-ever airbnb home in Woodstock. The multitude of strip clubs we passed did little to reassure us we had made the right call, nor did our hosts’ admonition to remove all valuables from the car because there are prowlers in the neighborhood. Despite this shaky start, we stayed in a beautiful, brand new home and it was a great experience. Ours was one of the rooms in the finished basement, with an air mattress (the fancy kind that is as high as a low bed) and good WiFi. The half bath was on the main floor and the shower another flight up. Everything worked well, the water pressure was strong and they provided towels and bath products. Brian and Shannon are superb hosts. They are warm and welcoming yet mellow, offering a printed few pages on the house and the area and a wealth of recommendations on request. Brian makes excellent coffee in the morning and even shared some Morimoto Soba Ale and Rogue Hazelnut Brown Nectar (tastes like candy, in a good way) before our dinner the following night. Which reminds me, Jay and Erin told us about sour beer which evidently is popular in Portland and perhaps elsewhere. It is evident that our hosts love Portland, and they are eager to ensure you will, too. At 7:15 pm we tried to go to Khun Pic’s Bahn Thai but it was closed today, so instead we ate at Chiang Mai on Hawthorne. It is a small, unassuming place with some sidewalk seats and prompt service. Jenni enjoyed her shrimp pad thai and I my yum jeen gai. There are Thai restaurants everywhere in Portland, and while tasty this type of ethnic food may not represent the best value in Portland, at least relative to what is on offer in other cities. I can get better Thai food at the same price in LA, but would be hard pressed to find delicious hand made pasta like Jenni had at Grassa for under $10. I am struck by how quickly we (in the broad sense) are able to adapt. At first it felt slightly odd to be sleeping in a stranger’s house that is not a proper lodging establishment. The next morning it seemed entirely normal. August 25, 2013 (Sunday) – Plans to hike Dog Mountain in Washington were quickly abandoned when we slept in a bit and saw the forecast was spotty. It is supposed to be a challenging day hike with glorious views, be sure to get a Northwest Forest Pass for parking if you go. Instead, we zipped over to the Yolk food truck at 48th and Woodstock for breakfast egg sandwiches. I think we are all grown-ups and can agree that huge, calorie-laden sandwiches are interchangeable with strenuous hikes. Jenni got the Sunshine and High Clouds with sautéed spring vegetables, chives, shallots, goat cheese, and saba on an English muffin. I got the Brother Badass with maple glazed pork belly, aged white cheddar, and Dijon tossed greens on a baguette with a little hot sauce. It was excellent. I have been impressed with the bread in Oregon, which most sandwich aficionados will confirm is the most important ingredient. After, we visited the farmer’s market in the Key Bank parking lot at 47th and Woodstock, open part-year 10 am to 2 pm on Sunday. The usual fare was available, including tomatoes, berries, peppers, honey, fish (including Columbia River wild sturgeon), meats, hazelnuts, jams, etc. 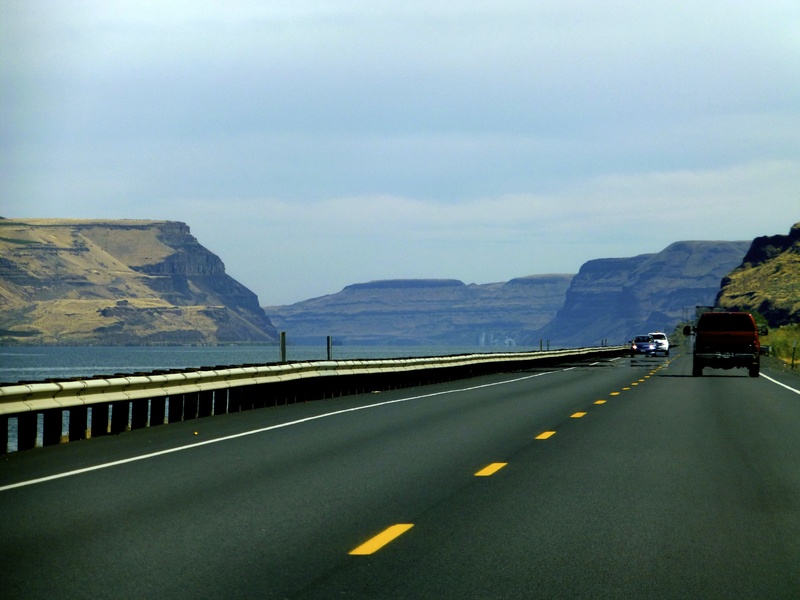 We headed East and grabbed the 205 North to the 84 East to exit 17 (Troutdale) for the Historic Columbia River Highway. This is not the quickest path to Multnomah, but perhaps the best compromise of speed and scenery. We caught some nice glimpses of Mount Saint Helens (I believe) to the North as we drove. The waterfalls begin several miles East of Troutdale and we parked beyond at the Wahkeena picnic area and did a loop hike from there over to Multnomah Falls Lodge. It took about 2 hours 15 minutes from trailhead to lodge and then another 10 minutes or so for the half mile back to the car. Our luck with flawless weather ran out as it rained most of the time. This did not detract much as we had raincoats and were hiking through verdant forest with rushing streams and magnificent waterfalls. It occurred to me how spoiled we are in LA; I think the last time I recall hiking in the rain was Peru in August 2009! Back in the City of Roses we had a late lunch at Little Big Burger on SE Division Street. This is a local mini-chain with $3.75 quarter pound burgers that are diminutive in diameter but fairly thick. A choice of cheddar, swiss, goat or blue cheese is complimentary and I added bacon for $0.50. The burger was tasty though slightly overcooked, and the truffle fries ($2.75) were pretty good. Everything is locally sourced and compostable. Up the road we visited Stumptown Coffee for a strong cup of jo and a chai latte, and next door is the Woodsman Market which crams a lot of delicious looking fare into a small space. Back at the house we worked a while and then met Samir and Mae at Nostrana at 9 pm. Apparently many Portland restaurants offer late night happy hour menus, so we got Insalata Nostrana, olives, nuts and a margarita pizza with a couple of draught beers for $31 total. The menu offers a lot of delicious sounding options and this place is very well-reviewed, but we kept it simple and cheap. It was great to catch up and we went home after Samir and I bored the ladies to tears with an obviously riveting conversation about Detroit and municipal insolvency. Brief observations and additional information on Portland: There are semi-permanent food trucks in little parking areas all over the city. Everything is compostable. Major emphasis on locally sourced ingredients…grass-fed beef, antibiotic and GMO free, etc. The Pearl is the upscale/trendy district with more high-end shopping and restaurants. Nob Hill seems to be more yuppy-like. The Eastside has more hipsters and is grittier. There are clusters of bars and restaurants on Hawthorne, Division and Belmont. There are lots of bicycles and dogs. Smoking is more prevalent than in LA. Beer and coffee are religion. We initially tried to stay at the Portland Hawthorne Hostel but it was full and they recommended the Bluebird Guesthouse, which also was full though it opened up after we had booked airbnb. For inexpensive accommodation, you might try those places. If money is not an issue, you probably ought to stay downtown. We heard the art museum there is quite nice. August 26, 2013 (Monday) – Eager to get started on the four hour drive to Walla Walla, breakfast was an apple and Saturday night’s pad thai. It is rather scenic following the Columbia River gorge much of the way. Folks drive pretty slowly in these parts; on the 84 East I was doing 71 in a 65 and passing almost everyone. Fairly quickly the landscape changes from the wet, green scenery of Portland and its environs to barren and rocky, reminiscent of parts of Utah or Wyoming. This entry was posted in North America, Oregon, Uncategorized and tagged Oregon, Portland on September 12, 2013 by aleavitt77. August 20, 2013 (Tuesday, cont’d) –We waved goodbye to California and boldly went where many have gone before: the alluring Oregon coast. The offshore rocks grow even larger and more impressive, often covered in green, some resembling small islands more than large boulders. We took the turn off for Cape Blanco and saw a young deer in the road on our way to the lighthouse and nearby campground. After much debate, we passed on staying here. It is rustic and remote-feeling with good privacy and electricity at each site, all for $20/night. There are cabins available to rent, but all were taken. Detractions included persistent strong wind and poor light, plus we preferred to get further up the coast today. The jury is still out whether we made the right call. We also declined Eel Creek Campground and continued up to Honeyman State Park. Honeyman has roughly 400 sites and was packed with families and dogs. Privacy was non-existent. Nonetheless, the facilities were nice, everyone was very friendly (neighbors gave us s’mores, another camper took our trash to the dumpster, the host offered a homemade egg carton device as a fire starter) and the location served us well. We got a first-come site (#222) for $21/night and there were free hot showers and bathrooms with soap dispensers and paper towels. Yes, less than a year ago I was staying in overwater bungalows in the Maldives and now I’m amped about complimentary paper towels. We drove three miles to Florence and bought provisions at a mediocre Safeway. I grilled some corn and boneless chicken thighs marinated in Sweet Baby Ray’s original BBQ sauce. I think boneless chicken thighs may be the most underrated cut of protein out there. (If any of you have connections at Tyson Foods, I’m available for a marketing position.) We also bought ear plugs which helped at a crowded campground, though I was astonished at how quiet the place was each morning until about 8 am. August 21, 2013 (Wednesday) – We rose a little after 7 am, had yogurt for breakfast and headed into Florence to Siuslaw River Coffee Roasters by the bridge. This is a nice coffee shop, but the WiFi was weak and that paired poorly with our goal of planning our next several nights. Striking the right balance between flexibility and plans is a work in progress. It is nice to wing it, less so to worry about where you are sleeping each night. The fact that it is peak tourist season exacerbates the difficulty of finding last-minute accommodation. Six hours later (seriously), we had booked all our nights through Big Sky, MT and felt good. Florence seems moderately charming with its blend of chains and small coastal town vibe. Lunch back at the campsite was Triscuits, salami and Tillamook smoked cheddar. We walked about 50 feet over a dirt trail and emerged in another world. 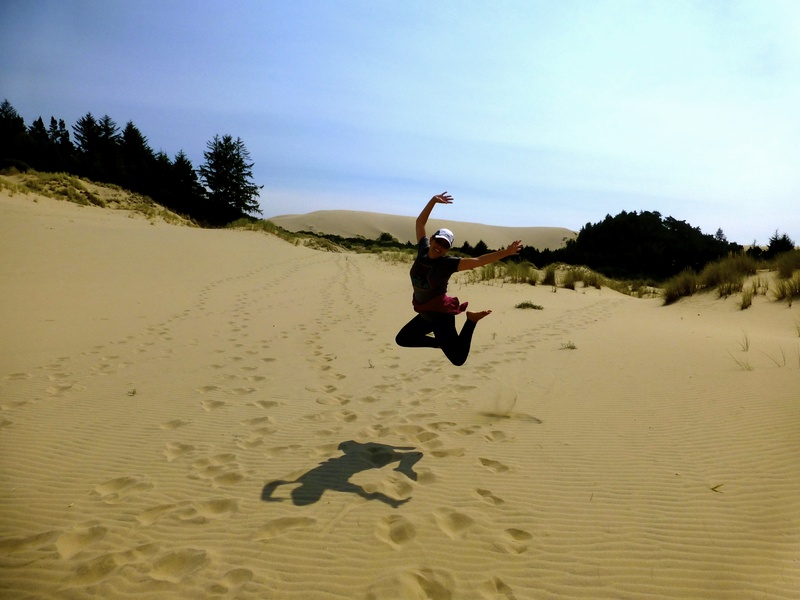 Honeyman sits at the Northern end of the Oregon Dunes National Recreation Area, and the sand dunes are expansive and spectacular. They span roughly two miles to the ocean. It is possible to walk all the way, but I’ve been under the weather and walking up and down large hills of sand is exhausting. Side note: There is a good chance that all the jumping pictures you see will be of Jenni. She has not mastered the photo timing, so the ones of me just look like I am stretching. And as many of you know, that just looks like me anywhere in the world. Also, after several pure barre classes it appears her vertical leap has surpassed mine. We traveled parallel to the coast perhaps one-third of a mile to Cleawox Lake. The dunes closest to the campground are off-limits to vehicles, but a little farther out is a huge area with ATVs, dirt bikes and guided tours on dune buggies holding 10+ passengers. I went for a dip in Cleawox, which was cool but surprisingly nice and refreshing. They may rent canoes/kayaks etc. at Cleawox, but if not they certainly do across the highway at Woahink Lake. The showers were empty at 5 pm, after which we BBQ’d and made another campfire. August 22, 2013 (Thursday) – Thunder frightened us into packing quickly and hitting the road for some McDonald’s breakfast meals. These never disappoint. The coast was shrouded in fog but we decided to continue anyway (out of the way) for what we had heard was lovely scenery up to Newport. Eleven miles North of Florence we visited the Sea Lion Caves, billed as the largest sea cave in the US. Admission is typically $14 but today it was $8 because the sea lions recently unionized and negotiated four-day weekends. An elevator descends 200 feet through the rocks to a cave viewing area with some educational displays and a short video. It would have been nice to see the famed inhabitants, but we still enjoyed the experience and views of nearby Heceta Head Lighthouse. Continuing North, the coast stays rugged and lovely. There are several places to camp and many vista points. We stopped at Seal Rock then cruised through Newport’s historic bay front with its overwhelming smell of fish. At the petrol station, I learned that Oregon is the only state aside from New Jersey where it is still illegal to pump one’s own gas. This must be a defense mechanism when overshadowed by your neighbor. We headed East on Route 20 (somewhat windy and hilly but it moves pretty fast) and 50s and foggy turned into 80s and sunny by the time we hit Corvallis. The seemingly infinite forests of evergreen made it abundantly clear why the Douglas fir is on Oregon license plates. The Oregon State campus looks pretty nice. Monroe Avenue has some bars and restaurants while 2nd to 4th streets seem more of a “downtown” area with many commercial establishments. We ate PB&J sandwiches at our parking spot and walked around a little. Jenni traded in a book she had finished and bought two new ones at The Book Bin. We popped into Avalon Wine for some recommendations on wine country and Andy delivered this and countless tips for Portland (which he declared one of the best food scenes in the country right now, not a terribly controversial statement), plus a recommendation that we drive over the Cascades to Smith Rock State Park. Our itinerary was too full, but the pictures suggest this is regrettable. Route 99W is the more scenic route to Eugene, and we checked into the Timbers Motel around 3:45 pm. We got a basic room with queen bed for $69. Luxurious it was not, but the WiFi worked and the water pressure was good. I have two general rules when it comes to real estate. You want to be near the gay community and not near the bus station. Despite being across from Greyhound, the Timbers is well-located. We ambled East on 13th Street to the University of Oregon campus, then down to 18th Street, back to Pearl and up to Broadway. We considered buying a $20 ticket to join the monthly chamber of commerce networking event, held this month by Summit Bank with several food and beer stations. This is not to be confused with the daily hippy and weed-smoking networking event, held everywhere else in Eugene. The menu and space at Belly were appealing, but we settled at Bon Mi. Good choice! Jenni got a delicious spicy noodle pho with beef and my red hot pork ban mi was superb. The baguette was just perfect. Together with a Radiant Ale seasonal brew and an Oatis oatmeal stout, each from local Ninkasi Brewing, dinner cost $20. Dessert was a captain crunch donut at Voodoo Doughnuts, just the sort of 24-hour place you’d expect to find in Stonerton. Check out the selection and the incredible tag line on their donut-holding devices. We passed a couple more beggars and schizos and were back in the room by 7:30 pm for some more planning and blogging. Had we been in Eugene a day later, we could have enjoyed the Eugene Celebration. 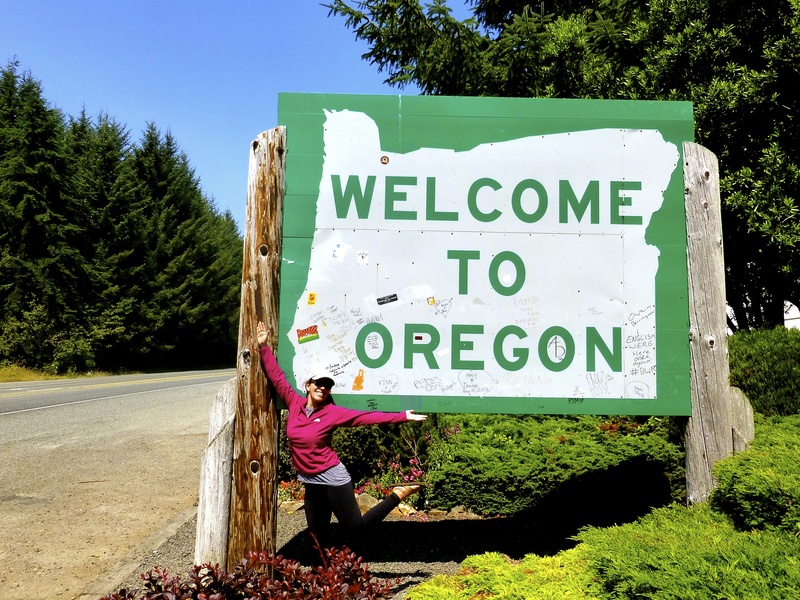 August 23, 2013 (Friday) – Willamette wine country, here we come. Around 10:45 am we headed Northwest and 75 minutes later arrived at a $10 tasting at Cristom Vineyards. This winery (with a small cluster of others) is in the Eola-Amity Hills American Viticultural Area (AVA), where it benefits from cool breezes off the coast that blow through the Van Duzer Corridor. I have now shared everything I know about wine. The refined palate and erudition of my wife and father-in-law have yet to reach my upper region. Though technically located in Salem, it is very quiet here; much less crowded than the McMinnville/Dayton/Dundee area. We enjoyed the wines then continued on Zena Road to 99W heading North. At Cristom’s recommendation, we ate lunch at the Blue Goat in Amity. It is a lovely space with high ceilings, exposed pipe and brick, and a wood-fired oven. We sat at a large curved counter though there are several tables and booths. As would be common over the next few days, the menu lists the local farms from which the restaurant sources its products. We split a very good smoked chicken salad sandwich with honey-balsamic slaw on the side, and a phenomenal dish of fresh Turkish figs with blue cheese and bacon. The figs were so fresh and delicious that they beat back my disdain for bacon and blue cheese. The damage was $23 including tip. We were also tempted by Uncle Jack’s BBQ, a door or two down. 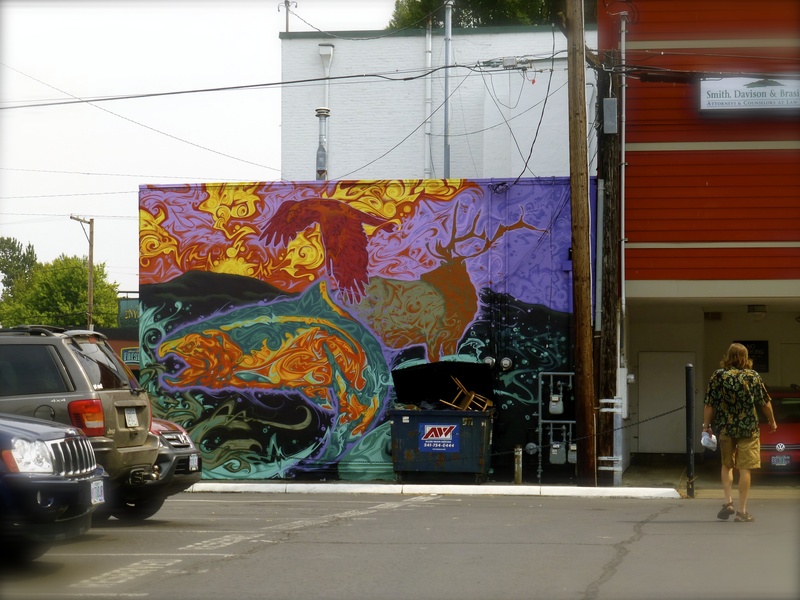 After lunch, we continued a short distance to McMinnville and walked around Third Street, the main thoroughfare. This is where McMenamins Hotel Oregon is located. It was full, but we heard it is a nice play to stay and a great place for a roof-top beverage. As with most of Oregon, there is ample free street parking. We poked our heads into Honest Chocolates and came away with a few treats, including a yummy piece of honey caramel milk chocolate with French sea salt. Walking distance from here is the Eyrie tasting room where we sampled six wines and had a nice conversation with the pourer, an East coast transplant who formerly worked in financial PR. Next up was White Rose located in the Dundee Hills. The tasting room is beautiful with great views from the property, but we were not fans of the $15 tasting of three pinot noirs. We headed back down the hill and up 99W to Four Graces. Set in a charming white building with a gravel yard and several wrought iron tables and chairs, we enjoyed our $10 tasting of five wines. The staff was very friendly and we purchased the Willamette Valley Pinot Gris 2012 for $20. Nearby was a roadside stand called Bert’s Chuckwagon that we heard serves good BBQ. Some tasting rooms close at 4 pm while others, like Four Graces, close at 5 pm. We shut it down and drove back up the Dundee Hills to Wine Country Farm, our B&B for the evening. We were greeted with a multi-course complimentary tasting of the house Armonéa wines before being shown our room: the Courtyard Suite. We paid $200 for a very large room with king bed and a couch facing the fireplace. There was another room available with a queen bed but a balcony, and we might have chosen that one had we realized the views from the property would be so nice. At the tasting we met Jay and Erin, a nice couple celebrating their 5th anniversary in the same place where they married. They joined us for an 8 pm dinner at Joel Palmer House, a ten minute drive away. As the name suggests, it is set in a quaint house and the restaurant specializes in mushrooms and homemade truffle oil. The standard option is a three-course $49 menu. We split a mushroom soup and a tart to start, the filet mignon with foie gras supplement ($15) and lamb for the entrée course, and a mushroom s’more and rice pudding for dessert. Even the unemployed must take advantage of foie gras outside the totalitarian regime of California. The meal was very good but I was not impressed. Drivers use stripped Model T Fords with stock mechanicals. Five cars are lined up with the engines off at the start line of the Averill Arena horse racing track. Drivers stand next to the grandstands. When the starter pistol fires, the drivers run to the opposite side of the front straight, grab a live 20-pound pig from a bin, then must hand-crank their car and drive it one lap. They then stop, kill the engine, get a different pig, and race another lap. The first driver to complete three laps in this manner without losing their pig is the winner. The race was first run in 1925. The official story is that two local farmers were chasing a runaway pig in their Model Ts and were having so much fun, they decided it should be a race at the next county fair. The Pig-N-Ford Races have been run every year since 1925. Drivers belong to the Tillamook County Model T Pig-N-Ford Association, and membership is often a lifelong affair. Cars and memberships are often passed down through families or sold to close friends. Some of the cars that first ran in 1925 are still on the track today. August 24, 2013 (Saturday) – Breakfast at the Wine Country Farm was excellent. It was a veritable feast of fresh biscuits and homemade jam, an egg casserole dish, sausage, bacon, and hash browns. On our way out of town to Portland, we stopped at the Red Hills Market in Dundee. This is your typical, classy wine country market with food to order, gourmet salts and sauces, charcuterie, cheese, wine, recipe books, etc. This entry was posted in North America, Oregon, Uncategorized and tagged Corvalis, Dundee, Eugene, Four Graces, Honeyman, Joel Palmer House, Oregon, Willamette, Wine Country Farm on September 6, 2013 by aleavitt77.